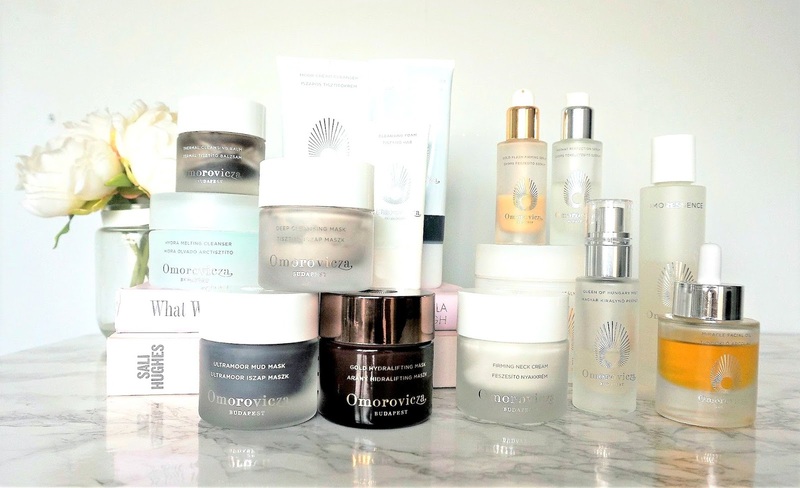 I am starting a new brand focus series on the blog, which will feature some of my favourite brands and the obvious choice for me for the first post is Omorovicza. It is, without doubt, one of my favourite skincare brands because the products are so gentle yet very effective on my dry and sensitive skin. I have tried quite a few products from the brand - most I have bought myself (repurchased some several times) and some were sent to me but my opinion is always honest. This post isn't sponsored - I'm just genuinely in love with this brand and excited to start a new series on my blog! Omorovicza is a Hungarian brand and all of the products contain healing mineral water, are paraben and silicone free. They also exclude synthetic colours and fragrances and microbeads. There are four collections: Mineral, Moor Mud, Gold and Blue Diamond. I have yet to try anything from the Blue Diamond range but have tried a few from each of the others and today will share my thoughts on them. It is a luxury skincare brand with price tags to match but I will share my tips with you at the end of the post on how to save some money. Omorovicza have four cleansers and I have tried all of them so I will share my thoughts on those first. Cleansing Foam is a mousse cleanser that foams when water is added and the result is squeaky clean skin without the stripped feeling. It is an ideal morning cleanse due to how refreshing is. I think that it would be most suited to those with oily/normal/combination skin although my husband loves to use this when he has an eczema flare up so it would suit sensitive and dry skin too. £44 for 150ml. Thermal Cleansing Balm is the product that started my love affair with Omorovicza and I have repurchased it several times over the past 18 months. Balm cleansers are my favourite type of cleanser and this is one of the best I have ever tried. It took me quite a while to get around to trying this product because I mistakenly thought that it might not suit my sensitive skin because of the word thermal in the name. In the past, any time that I used a thermal product my skin reacted badly because they were always self-heating, but this product could not be more different - it is extremely gentle on the skin and it deeply cleanses the skin, leaving it soft and glowing. I love giving my skin a thorough massage when I use this and it melts every last trace of eye makeup - even stubborn mascara and liquid liner without the need to pull or tug and doesn't leave any film or residue. It is an absolute treat to use and is definitely in my top 3 cleansers of all time. This would be suitable for all skin types. £48 for 50ml. Moor Cream Cleanser is the most recent Omorovicza release and I ordered it before I even received the press release because I had a feeling that it would be right up my street due to how much I love the Ultramoor Mud Mask. I have only been using this for around a week so I can't give a full review just yet but my initial thoughts are that this would be more suited to those with combination skin than those with dry skin or else, used once or twice a week rather than daily for those with dry skin, which is how I plan to use it. It isn't drying but also isn't hydrating whereas the Thermal Cleansing Balm feels hydrating. It has an almost antiseptic scent, which is very refreshing for a morning cleanse. It is a cream, which is applied to damp skin, massaged in and then rinsed. It wouldn't be suitable for use in the eye area but as a second cleanse or morning cleanse, it is perfect. It is very similar to Aurelia Probiotic Miracle Cleanser if you are familiar with that. £49 for 150ml. Hydra Melting Cleanser is a gel-cream cleanser, which is different from other cleansers I've tried because it isn't as stiff as a balm or purely oily, yet it works just as well as a balm. It leaves my skin feeling really clean and refreshed, but not stripped at all. I prefer to use it as a second cleanse, rather than a makeup remover and I love how comfortable my skin feels after using this. £65 for 100ml. Out of all four cleansers, my personal favourite is the Thermal Cleansing Balm, which is the one that I have repurchased several times. It is one of the products that I recommend most to friends and family when they ask for a recommendation for a skincare treat. Refining Facial Polisher: This is the only exfoliating product that I have tried from the brand and although physical exfoliants are not my favourite type, sometimes I feel like I need a good scrub. That being said, I don't want my skin to be torn or aggravated as it is already prone to inflammation and is sensitive. This green coloured exfoliator contains lactobionic and fruit acids, lava stone and micro-algae and is the perfect quick skin fix to combat dull skin. I massage it into my skin - concentrating on any areas of congestion initially and then the rest of my face, Whilst doing this, it turns from green to grey in colour, I then leave it to work its magic for two minutes before rinsing thoroughly - the result is brighter skin and refined pores. It is gentle enough to use on sensitive skin and would be suitable for all skin types. They also sell a more gentle exfoliator and two peels, but I am yet to try those, however I am very eager to because my skin responds very well to AHAs. There are four Omorovicza masks available but I have only tried three of them. The first one that I bought is the Deep Cleansing Mask, which is unlike other clay masks that I have used because it doesn't dry the skin out or leave it feeling tight and isn't too harsh on my sensitive skin, yet it really does give a very thorough cleanse. It is perfect for areas of congestion and leaves my pores looking more refined. It is lighter in texture than other clay masks that I have used so I think it would be suitable for all skin types. £60 for 50ml. The Ultramoor Mud Mask was sent to me last year and became an instant favourite. You may have seen my post where I described it as "Spanx for your face" because that is exactly how it feels! It lifts and firms the skin like nothing else I have tried before, as well as giving a deep cleanse and exfoliation. My skin is left glowing and looks like I have had a facial after I use this. If you are aged under 30-35, the Deep Cleansing Mask would suffice for a deep cleanse but for anybody over that age, I would highly recommend that you buy this mask because it gives the same deep cleanse but with the added benefit of firming the skin, £65 for 50ml. The Gold Hydralifting Mask is perfect for soothing sensitive skin and giving it a boost and glow. It is rose scented, which I find soothing in itself and I find that I reach for this mask most when my skin is stressed and dull, rather than congested. All of the products in the gold range help to reduce inflammation. Although it is described as a lifting mask, I don't find it to be as powerful as the Ultramoor mud mask in that way. It plumps the skin rather than lifts it in my experience but that means that my skin looks more rested when I use it, feels very soft and looks smooth . £115 for 50ml. If I had to choose just one mask out of the three, it would be the Ultramoor Mud Mask for the glow it gives and the firming action, but I love all three. They also sell an Instant Plumping Mask, which I would love to try - plump skin always looks more youthful. The Queen Of Hungary Mist is another product that I have repurchased several times. It is so refreshing and uplifting but does not sting the skin at all and is ideal for use after cleansing or a cleansing mask, to rehydrate the skin. It is also perfect for a pick me up during the day because the spray is so fine that it won't disturb your makeup. £48 for 100ml. One of my favourite Omorovicza products is Omoressence. Before receiving this, I had never used an essence and I really didn't know if it would do much for my skin - how wrong I was! A few drops of this daily (applied after cleansing & before serum) has banished all signs of dehydration from my skin. It is extremely gentle and immediately soothes and hydrates my face, preparing it for the rest of my skincare. I realise that it is expensive, but literally two drops is all I need every morning so it lasts for a very long time. £75 for 100ml. There are five serums available from Omorovicza but I have only used two. I received Gold Flash Firming Serum as a Christmas gift from my husband the year before last but I only started to use it midway through 2016 and I find that I reach for this on days where my skin feels stressed or inflamed. I take a lot of medication for my illness and sometimes the meds can leave my whole body and skin inflamed so this gold range is ideal for combating the inflammatory effects of the meds. My skin always looks calmer and more glowing when I use this. £135 for 30ml. Instant Perfection Serum is described as being suitable for oily/combination skin but I find that it works really well for my dry/sensitive skin. It has an almost gel like texture and I find that it instantly plumps my fine lines, blurs my pores and makes my skin look incredibly smooth. It is suitable and would be beneficial for all skin types. £80 for 30ml. I love a good face oil and Miracle Facial Oil is a great one. I'm not the biggest fan of the word miracle or magic in the name of a skincare product but I'll forgive them that because I really like this oil. It improves the elasticity of the skin and plumps it, which results in it looking more youthful. I like to mix it with my moisturiser on mornings when I feel that my skin is extra dry or before my moisturiser at night. It is non-greasy, absorbs instantly and I only need to use around 2/3 drops to cover my entire face and neck. Suitable for all skin types. £75 for 30ml. The latest release from Omorovicza is the Firming Neck Cream, which was kindly sent to me. I'm always screaming at my screen when I see beauty vloggers on youtube showing their skincare routine but they don't touch their necks! I remember our Science teacher in school telling us that the neck is the first place to show signs of ageing due to how thin the skin is in that area and it stuck with me - it is so important to use all of your skincare products right the way down to the decollete area. I normally just use my regular moisturiser or oil so it is a nice treat to have a neck cream. This cream has a nice amount of 'slip' to it and only the tiniest amount is needed for each application. I have only been using this for a week so it is too early to say if the skin is firmer, however I am really enjoying using it and will report back in the coming months with my overall thoughts. £95 for 50ml. I have only tried one product from the body care range and that is the Gold Sugar Scrub, which is a really beautiful exfoliator. It has a creamy, yet gritty texture and really buffs away the dead skin cells to leave the skin glowing and prepped for the next step - be it tan or moisturiser. My skin feels so soft and smooth when I use this and a little goes a long way. £57 for 200ml. As you can see, I haven't used every product from Omorovicza but I have used enough to be able to declare it as one of my favourite brands. Yes, it is an expensive brand, but it isn't a case of style over substance. The luxurious packaging looks great but the products inside are even better. If I had to choose my favourite products or recommend where you should start if you have yet to try anything from the brand, I would go for the Thermal Cleansing Balm, Omoressence and Instant Perfection Serum. As you can see, I have not yet tried any of their eye creams or moisturisers but I plan on doing so and I am also curious about their fake tan. If you are wincing at the prices but want to try the products, then take a look at their starter sets. Also, I find that Lookfantastic almost always have a 15-20% discount code available and it can be used on Omorovicza products. If you order directly from Omorovicza, they have a loyalty scheme where you can earn points, which can be converted into savings on your orders plus you can also order some samples of other products. Omorovicza can also be bought from Cult Beauty, Space NK, and Feel Unique. Space NK currently have a £15 discount on orders of £60 or over so if you feel like treating yourself, now is the time! Edited to add that Cult Beauty currently have an offer where if you spend more than £70 on Omorovicza, you will receive a free deluxe sampler kit with 6 samples. More info here. If you have made it this far, thank you & well done! I hope you enjoyed this post and I'm looking forward to continuing this series with other brands that I love - both in terms of skincare & makeup. Have you tried any Omorovicza products? Can you recommend any to me? Are you interested in trying any of the products I have mentioned here today? I would love to hear your thoughts in the comments below! All products are bought by me, unless otherwise stated. In this case, the following products were sent to me: Omoressence, Ultramoor Mud Mask, Gold Hydralifting Mask, Instant Perfection Serum, Miracle Facial Oil, Firming Neck Cream and Gold Sugar Scrub but I bought the other products mentioned. Opinion is always my own.